A Visit to Bodegas Torrevellisca, Zagromonte, Terres dels Alforins. My second visit to a Bodega this month coincidentally was also to a former Cooperative building, that of Torrevellisca on the outskirts of the pretty little town of Fontanars in the Val D´Albaida, part of DO Valencia ( Clariano). Unlike Banús in Benlloch in this old building they are not using the previous facilities….other than the space available, all the old equipment having been ripped out and replaced with state of the art technology and a new office block in the interior! The Bodega Seen From the Air. The property has a `Royal´ history having been part of the former estate of Don Luis Melo, Marquis of Vellisca who renounced his claim to the crown of Portugal and in 1880 settled into El Balco where he built the Torre Vellisca. Fontanars is a significant wine growing area within the Clariano producing some of the best wines within DO Valencia, and wines grown from these times were reputedly excellent. Indeed the area has been called the `Spanish Tuscany.´ Of course like many other properties Torrevellisca has changed hands over the years and the current building was erected in 1993 as a Co-op with twenty-eight members. Some of these changes have not been without controversy. 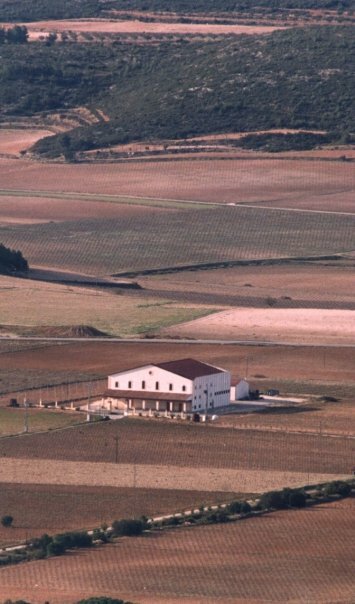 However today the bodega is in the hands of Zagromonte, a young team dedicated to the production of quality wine through very technological processes. Having met Rafael Penades, one of the administrators, at the local L´Alcúdia gastronomy fair ( see October archives) I was invited to visit the bodega. Here I was introduced to the new and young management team of Natalia Strelchik and Emilio Arellano Samper, the winemaker. We undertook a visit of the experimental vineyard which flanks the facility with its huge array of stainless steel tanks, modern all-singing, all-dancing bottling and labelling line from Italy, and then the barrel park underneath the bodega. The vineyard has Macabeo, Malvasia, Verdejo, Verdil and Chardonnay as well as Cabernet Sauvignon, Monastrell, Tempranillo and Merlot and covers about 4 hectares. It sits as do the vineyards of their producers in the centre of the valley with water from rainfall seeping its way down and leaving the soil permanently damp. Part of the Italian Bottling Line. The bodegas owners describe themselves as wanting to `combine tradition and innovation in a harmonic balance´to bring the best out of the wines produced. So here there are no `old fangled ideas´ of ecological or biodynamic production. The former suppliers of raw materials to the co-op are contracted to the new owners. They produce grapes to the requirements and quality standards required by them and are paid accordingly. It is the bodega which determines the fertilisers used, the optimum moment for picking etc and before the harvest Emilio visits the producers , takes samples and undertakes tests for acidity, sugar , ripeness etc. This year the alcohol point reached 14% in the reds. The bodega now aims to produce a style of wine for consumers to a high standard and with consistency so that customers not only appreciate the wines they drink but associate good times with it and come back regularly for more. To this end Emilio is using the larger deposits less and less ( there is a two million litre capacity ) and making wine in the smaller 15,ooo litre deposits, This has resulted in a drop in production but this is balanced by an increase in quality. The bodega is using special yeasts which can enhance certain flavours and control the level of fruit tasted in the wines. Emilio believes he can make adjustments within a tolerance of about 10% in this way. 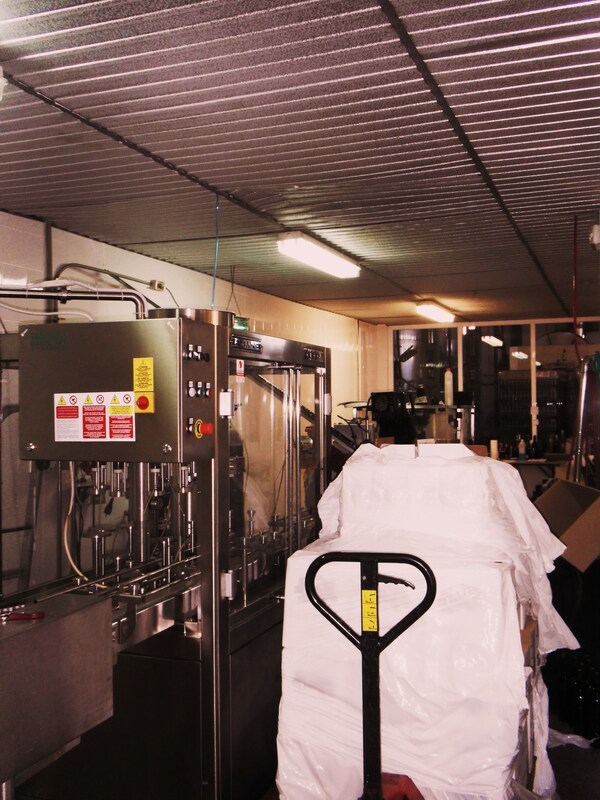 The new bottling line was imported from Italy as it is much more modern than those produced here. The bodega believes very much in presentation as much as the contents so there are different types of bottles and different styles of label from modern graphics, through a new wrap around label which leaves a space at the back in the shape of a wine-glass, to more traditional labels for those marques which merit them. The bottling line can cope with all of these parameters. And the market for their wines is International with wines exported to Russia, China and Holland currently , although not yet to the UK. 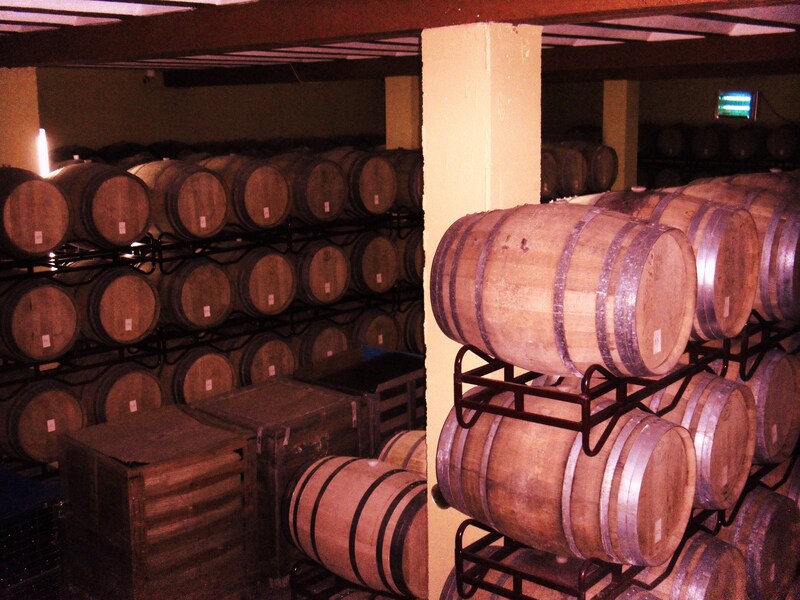 Down in the cellars the wines are aged in a mixture of French and American oak often pre-blended depending on which marque they are destined for. The bodega also possesses a shop and tasting area and it was to here we moved next to try some of the wines I had not recently tasted in L´Alcúdia, commencing with a white crianza. This was a 2006 from 100% Macabeo, with 16 months in American and French oak and 13% ABV. Pale gold with green flashes clean and bright. On the nose, melon, honey, patisserie and in the mouth round, subtle with a long finish with vanilla. Not overoaked at all, this is a very nice white wine. Second wine was a Crianza from 2006, a 75% Tempranillo, 25% Cabernet Sauvignon blend with nine months in oak. There are only about a 1000 bottles of this wine left. Ruby red, moving to a terracotta edge, long legs. On the nose blackcurrant and blackberry, hints of cedar and in the mouth very smooth tannins, oak, and a long finish with lots of ripe fruit. 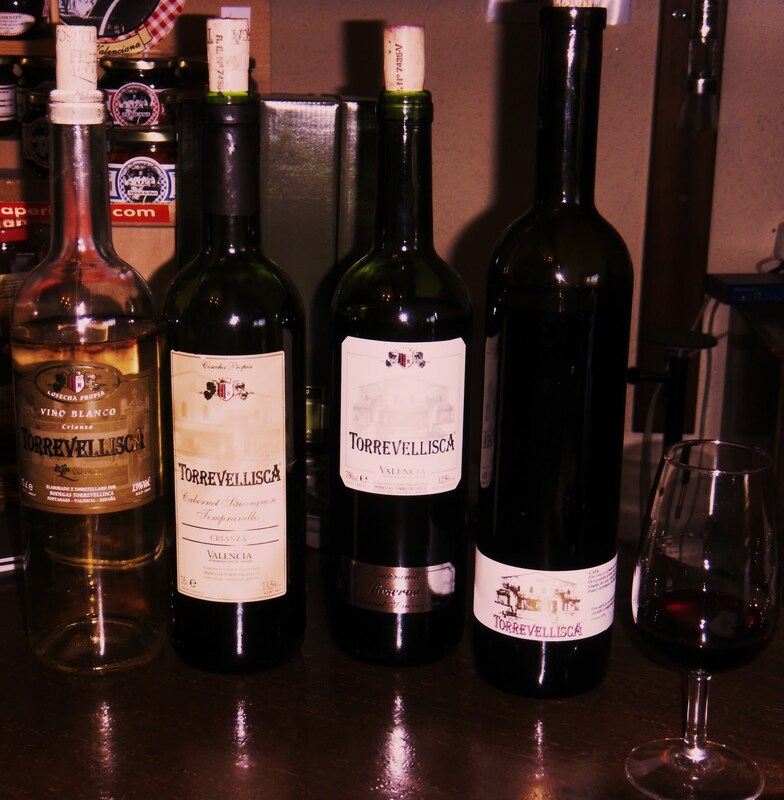 Third wine was a Torrevellisca Reserva, also from Tempranillo and Cabernet Sauvignon and 12.5%ABV. From 2006 and with two years in American and French oak and similar in bottle. A medium density wine, dark cherry red with long legs. On the nose quite floral, fruity, hints of grass. In the mouth round, smooth tannins, fruits of the forest, and a long finish , quite creamy with notes of oak. Finally we tasted the 2005 Merlot, a pure Merlot and a traditional marque at the bodega, crianza in style with 14.1% ABV, the wine was winner of a Bachus silver medal. The crianza in a mix of French and American oak, after 15 days maceration and then fermentation, the crianza was for 12 months. A very dark black cherry colour, with a ruby edge and long legs. Damson and plum on the nose, cherry, floral, (violet) with hints of orange peel. In the mouth very full, well-balanced, and with a very long finish. From a newly opened bottle my feeling was that it needed quite a long aeration in decanter to show at its best. For notes on the top of the range and new wines Brundisium, Argentum and Aurum see my post on L´Alcudia Gastronomy fair. These wines are I suspect more representative of the new style of the bodegas owners than the wines tasted which of course whilst excellent represent a hangover from the past. I am not generally a fan of modernity but I was more than pleasantly surprised at the quality of the wines across the whole range and have already used two in tastings I have organised and selected three more for future events. Price to quality ratio is also excellent making this a bodega with a management team to watch.